On Monday, I participated in the Principal Challenge. My goal: Read from the morning bell to dismissal time. This initiative is promoted by the Scholastic Book It Program. 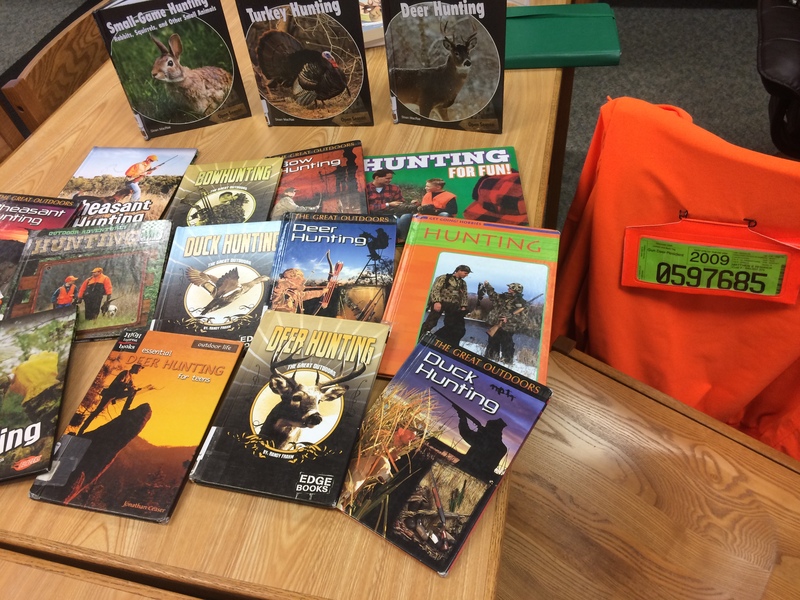 The theme for my second year was “Hunting for a Good Book”. I haven’t deer hunted in four years (both of my kids were born around opening day). I had to dust off my hat and coat for this event. 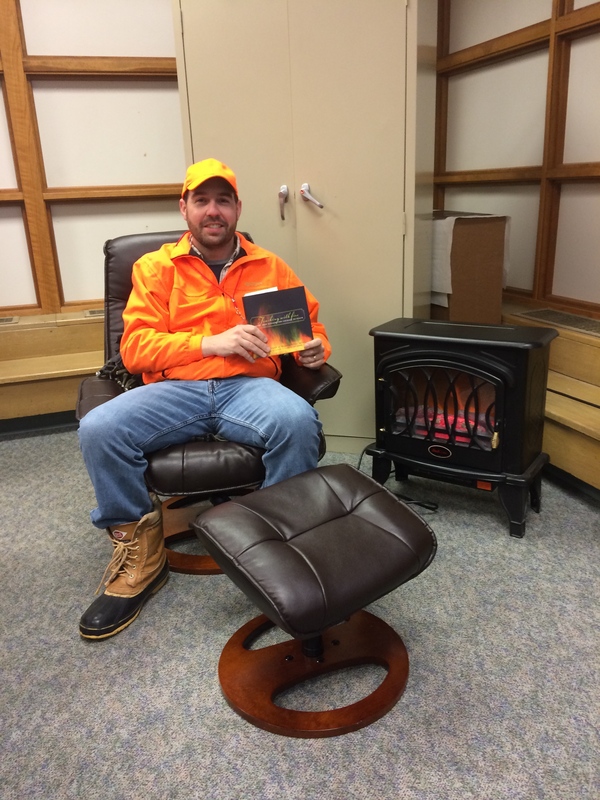 My library aide and her family hooked me up with a fake fire and the cozy reading chair. She also set out several nonfiction titles related to the theme. Yes, these are all catalogued in our school library. Welcome to Wisconsin! I had brought several books and journals to my “hunting shack” in the library. However, I had very little time to read. 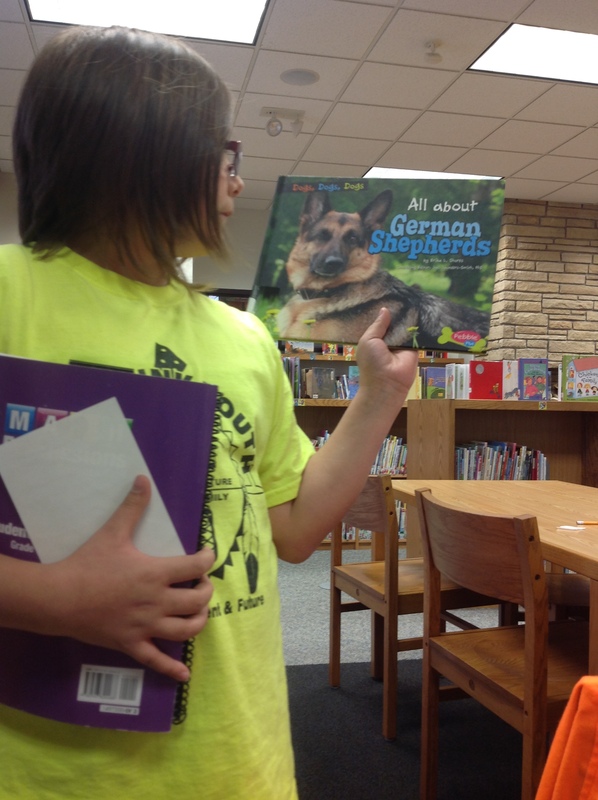 The previous week, students were encouraged to recommend a favorite book to me while visiting the library. This resulted in 85 students suggesting titles to me throughout the day! My day was spent taking pictures of students with a favorite book, asking them why they were recommending it, and documenting the title and author on a Google Doc. This Doc was shared with staff so they could see what students were currently reading and share these recommendations with other students. The pictures are on display in the front lobby. The students didn’t get to see me read. Instead, they observed how interested I was in what they were reading for enjoyment. They also had the opportunity to practice giving a book talk for an authentic audience. The Principal Challenge is still going on through Friday, November 14. If you are a building principal, at whatever level, I cannot imagine a more important activity you could do than letting your students see you as a person who values literature and literacy. Below is a listing of all the books recommended to me by our students, organized by grade level. “NF” denotes nonfiction. Geronimo Stilton: Watch Your Whiskers, Stilton! I remember when you did this last year, and I thought it was such a great idea! Ugh, I’m so mad I missed it again (I know I didn’t technically miss it yet, but it’s too late to set something up now). I really want my principal to do this! I’m putting it on my calendar for next year! BTW, LOVE the hunting theme! Great idea to promote literacy, specifically reading. Role models are important in the evolution of ‘reading for pleasure’ which is different from ‘reading to learn’. Great Mr. Renwick ! Thank you Dr. Van Slyke. An excellent book came out recently, titled “Read, Write, Lead” by Regie Routman. Everything an administrator would need to get started on the road toward literacy leadership is in this resource.